In the 1950s people envisioned the 1980s as the age of moon colonization and everyday space travel amid continued Cold War shenanigans. Along that time line the Foo corporation and its subsidiary, Nucleo, have dominated the market, and a new head of the company, Mr. Salt, plans to take it to the next level by building the first lunar theme park and resort. But the Green family next door might present a challenge as Grandpa tightens his tin foil hat and enlists the help of little Johnny and Suzy in finding out the secret of what’s lurking in the Salts’ basement and really driving the Foo Corporation to dominate the lunar tourist industry. Buy Nuke Punk in audiobook, paperback, or Kindle edition at amazon. 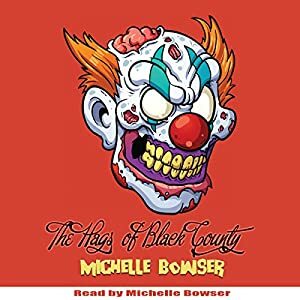 THE HAGS OF BLACK COUNTY by MICHELLE BOWSER now available on audiobook! When a construction Company needs to bury a pipeline through its ludicrous hills and valleys, a twisted charm goes to work and every aspect of already bizarre Black County life takes a gory turn for the hysterical. Take a preposterous trip along with its citizens, both native and new, through escapades such as the Hag parade, the grand opening of Madame Skunk’s House of Ill Repute, the demolition derby riot, and the rabid zombie clown apocalypse. Download The Hags of Black County today at amazon or audible.